PERSONALIZED LABELING AT NO EXTRA CHARGE on orders of 30 bottles or more. Use comments box during check out to type your name or business name, phone number or website for your labels. This item comes with a Silver Cap and Silver Standard Label in our new 2oz Frosted Round Glass Bottle. Please note that the bottle is frosted and transparent without any color. We just used a dark fragrance for photographs. The bottle will take on the color of the liquid inside. If you would like a different color label, please request it in the comments box. * $6.50 each when you order 1, 2 or 3 bottles. * $5.95 each when you order 4, 5 or 6 bottles. * $5.25 each when you order 7, 8, 9, 10, 11 bottles. A: Thank you for your question and interest. We offer samples of the fragrances in Body Oil form here: https://www.perfumeoildirect.com/1-Dram-Sample-Fragrances_p_26.html. 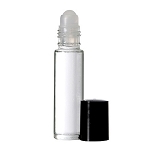 We also offer mini sprays so you can test the spray formula without getting a big bottle: https://www.perfumeoildirect.com/Fragrance-Oil-Mini-Spray-BASIC-LABEL--As-Low-As-125_p_98.html. We suggest trying samples to make sure that you like our version of the fragrances. Fragrance Oil Spray 2oz (Diamond Refillable w/PURPLE CAP) - As Low As $4.25!